In 1989 Carpetland USA of Virginia was originated in Roanoke, Virginia as a franchise of the national floor covering chain “Carpetland USA, Inc.,” founded in 1960. In 1992, a second store was added in Danville, Virginia. Through a series of acquisitions, these stores became members of a national buying group called “Flooring Alliance, Inc.” This group includes Carpetland USA, Color Tile, and other flooring entities that consolidate purchasing power while sharing marketing, merchandising and training innovations, and expertise. This is among the largest such groups in the nation. In the period of 1997 to 2000, three more locations were added in Christiansburg, Lynchburg, and Martinsville, Virginia. During 2004, a second facility was added in Roanoke, Virginia. While these six stores have been locally owned and operated since their inception, they have had the advantage of national buying power and support, offering Southwest Virginia the cutting edge of price, selection, service and value for over twenty years. Please come visit us and see what we have to provide you, our valued customer! 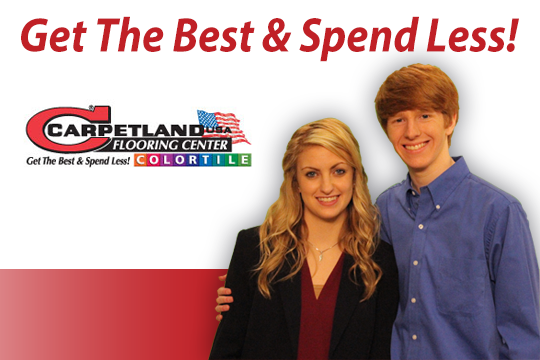 Want to join the Carpetland USA team?